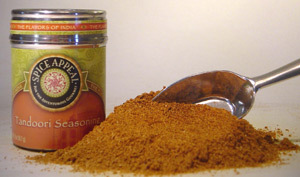 This spicy, curry-like blend gets its name from the traditional clay oven of India, called the tandoor. This wonderfully tasty and aromatic marinating spice creates a unique and flavorful taste to chicken, lamb and even baked fish. Tandoori Chicken is India’s most popular dish due to its reminiscent smoky and tangy flavor and appealing vermilion hue. Mix with yogurt and lemon juice to marinate chicken for this tasty dish. Add a dash to barbecue and buffalo wing marinades, pasta sauces, and gravies. This fragrant blend contains chili peppers, coriander, cumin, fennel seed, black cardamom, and a variety of other spices.